Source: Midwest Environmental Services Inc. 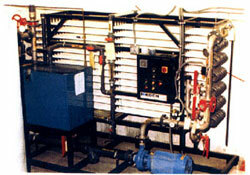 The ultrafilter system is constructed of tubes containing a very fine inner membrane filter tube. This polymeric membrane contains microscopic holes which allow water to pass through. Larger molecules of organic and inorganic materials are rejected. Treated wastewater is then discharged into the municipalsewer system. Concentrated waste can then be fixated for disposal. Our unit as installed is capable of processing up to 20,000 gallons per day of wastewater. At any time we can increase the capacity of the unit by the addition of membrane tubes. Prior to accepting wastes for processing a one gallon sample must be submitted for evaluation in our laboratory. The most typical waste processed are oil and water mixtures, water based inks, waters with suspended solids and water emulsions. Midwest Environmental Services Inc., 406 Staton Road, Henryville, IN 47126. Tel: 812-294-4518; Fax: 812-294-4702.